Sometimes the cost to paint the interior of a house is money well spent. Not only will you discover craftsmen with new design ideas, but you'll also alleviate the hassle of the detail work. Prices vary by location and the skill of the professional. However, if you're trying to pull numbers together to apply for a home improvement loan, the following figures will get you started. If you are prepared to do the work yourself, you can save over the cost of a professional. Keep in mind, however, that the job may take longer and require more touchups than a professional job, which may cost you more in time if not in money. 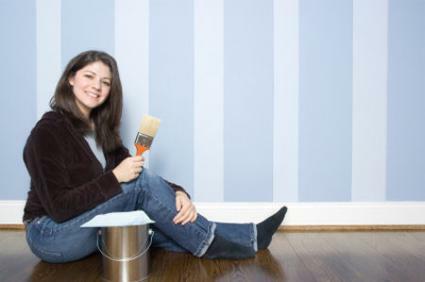 Paint and supplies will average approximately $300 to $500 if you're painting the interior of a 1,500 square-foot home. If you hire a professional, you'll probably still buy the paint; additional prices will come from the labor. These estimates do not include special work. Ask about fill-in jobs. If you don't mind the painter leaving a few items in your home, many contractors will slip in when they have time between larger jobs. There are numerous factors that may affect the bottom line in your cost analysis. Take these things into account to help control your pricing. Get a variety of quotes from bonded, licensed professionals. Request references and check with the Better Business Bureau. Ask for a line-itemized quote on special needs. Review the materials list in advance. Factor in repairs ahead of time. To get the best pricing for your paint job, make sure to get all your details in order well ahead of time. This will give you the most flexibility in finding a contractor, purchasing paints when on sale and negotiating a better price in off-seasons. Avoid making hasty decisions to ensure the job gets done on time and under budget.